Big men went early and there was a run on shooters late in the first round of the 2018 NBA Draft. The Atlanta Hawks selected former Villanova Wildcats power forward Omari Spellman with the No. 30 overall pick in the 2018 NBA Draft at Barclays Center in Brooklyn, New York Thursday night. In his only year with the Wildcats, Spellman averaged 10.9 points, 8.0 rebounds, 0.8 assists, 0.7 steals and 1.5 blocks over 28.1 minutes in 40 games, 39 of which he started for a Villanova team that won both the 2018 Big East Tournament and NCAA Tournament. A native of North Royalton, Ohio, the 6-foot-9, 260-pound Spellman shot 47.6 percent from the field, 43.3 percent from three-point range and 70.0 percent at the free-throw line. The Brooklyn Nets selected former Euroleague standout guard Dzanan Musa with the No. 29 overall pick in the 2018 NBA Draft at Barclays Center in Brooklyn, New York Thursday night. In limited action over three seasons with Cedevita Zagreb of the Euroleague, Musa averaged 6.7 points, 2.4 rebounds and 0.8 assists over 15.2 minutes per game. Despite having a $1 million buyout from his team in Croatia, the 6-foot-8, 19-year old Musa expects to be playing in the NBA during the 2018-2019 season. The Golden State Warriors selected former University of Cincinnati shooting guard Jacob Evans with the No. 28 overall pick in the 2018 NBA Draft at Barclays Center in Brooklyn, New York Thursday night. During his final season with the Bearcats, Evans averaged 13.0 points, 4.7 rebounds, 3.1 assists, 1.3 steals and 1.0 blocks over 30.8 minutes in 36 games for a Cincinnati team that won the American Athletic Conference Tournament Championship and went two rounds deep in the 2018 NCAA Tournament. In three years at Cincinnati, Evans averaged 11.7 points, 4.3 rebounds, 2.5 assists, 1.1 steals and 0.9 blocks while shooting 42.9 percent from the field, including 37.7 percent from three-point range, and 75.5 percent at the free-throw line. The Boston Celtics selected former Texas A&M center Robert Williams with the No. 27 overall pick in the 2018 NBA Draft at Barclays Center in Brooklyn, New York Thursday night. In two years with the Aggies, Williams averaged 11.1 points, 8.7 rebounds, 1.4 assists, 0.7 steals and 2.5 blocks over 25.7 minutes in 61 games, 40 of which he started. Williams shot 59.1 percent from the field, including 66.8 percent from inside the three-point arc during his time in College Station. Williams averaged 10.4 points, 9.2 rebounds, 1.4 assists and 2.6 blocks per game on the way to Co-Defensive Player of the Year honors in the Southeastern Conference in 2018. The Philadelphia 76ers selected former Wichita State point guard Landry Shamet with the No. 26 overall pick in the 2018 NBA Draft at Barclays Center in Brooklyn, New York Thursday night. During his final season with the Shockers, Shamet averaged a career-best 14.9 points to go along with 3.2 rebounds, 5.2 assists and 0.7 steals in 31.7 minutes over 32 games in the school’s first year in the American Athletic Conference after moving on from the Missouri Valley Conference. Over three years in the program, Shamet averaged 12.9 points, 3.0 rebounds and 4.1 assists while shooting 48.0 percent from the field, including a 54.2-percent mark inside the three-point arc, a 44.2 percent showing from long distance and 82.5 percent at the free-throw line. The Los Angeles Lakers selected former Michigan power forward Moritz Wagner with the No. 25 overall pick in the 2018 NBA Draft at Barclays Center in Brooklyn, New York Thursday night. During his final season at Michigan, Wagner had a career year, averaging 14.6 points, 7.1 rebounds, 0.8 assists, 1.0 steals and 0.5 blocks over 27.6 minutes in 39 games, all of which were starts for a Wolverines team that advanced all the way to the 2018 NCAA Tournament Championship Game. Wagner was an All-NCAA Tournament selection this past season. In three years with the Wolverines, Wagner averaged 10.4 points and 4.5 rebounds in 107 games, 77 of which he started. The 6-foot-10, 210-pound Wagner is a native of Berlin, Germany and began his playing career with Alba Berlin. The Portland Trail Blazers selected former IMG Academy shooting guard Anfernee Simons with the No. 24 overall pick in the 2018 NBA Draft at Barclays Center in Brooklyn, New York Thursday night. The Florida Class 7A Player of the Year for Edgewater High School in the spring of 2017, Simons opted for a prep season at IMG Academy after de-committing from the Louisville Cardinals following the dismissal of embattled former coach Rick Pitino. Simons averaged 18.9 points, 5.0 rebounds, 1.1 steals and 1.6 assists while shooting 45 percent from the field, 42 percent from beyond the three-point arc and 79 percent at the free-throw line during his final season before entering the 2018 NBA Draft. The Indiana Pacers selected former University of California-Los Angeles point guard Aaron Holiday with the No. 23 overall pick in the 2018 NBA Draft at Barclays Center in Brooklyn, New York Thursday night. In three years at UCLA, Holiday averaged 14.3 points, 3.2 rebounds, 4.7 assists and 1.2 steals over 31.8 minutes in 101 games, 65 of which were starts for a Bruins team that made back-to-back trips to the NCAA Tournament over his final two seasons in Los Angeles. During his final season at UCLA, the 6-foot-1, 185-pound Holiday averaged 20.3 points, 3.7 rebounds, 1.3 steals and 5.8 assists, all of which were career highs, while shooting 46.1 percent from the field, 42.9 percent from beyond the three-point arc and 82.8 percent at the free-throw line. The Chicago Bulls selected former Boise State guard Chandler Hutchison with the No. 22 overall pick in the 2018 NBA Draft at Barclays Center in Brooklyn, New York Thursday night. During his final season with the Broncos, Hutchison averaged a career-best 20.0 points to go along with 7.7 rebounds, 3.5 assists and 1.5 steals over 31.0 minutes in 31 games, all of which he started. Hutchison knocked down 47.5 percent of his shots from the field, including 52.3 percent from inside the three-point arc, 35.9 percent from long range and 72.8 percent at the free-throw line. In his four years at Boise State, Hutchison averaged 12.0 points, 5.5 rebounds, 2.1 assists and 1.0 steals in 24.0 minutes over 123 games, 89 of which were starts. The Utah Jazz selected former Duke University shooting guard Grayson Allen with the No. 21 overall pick in the 2018 NBA Draft at Barclays Center in Brooklyn, New York Thursday night. During his final season with the Blue Devils, Allen averaged 15.5 points, 3.3 rebounds, 4.6 assists and 1.7 steals over 35.6 minutes in 37 games, all of which were starts for a Duke team that advanced to the semifinals of the Atlantic Coast Conference Tournament and the NCAA Tournament’s Midwest Regional Championship game. Allen averaged 14.1 points, 3.2 rebounds, 3.0 assists and 1.0 steals over 27.9 minutes in 142 career games for the Blue Devils. He shot 43.0 percent from the field, including 49.0 percent inside the three-point range, 37.0 percent from long distance and 85.0 percent at the free-throw line. The Minnesota Timberwolves selected former Georgia Tech shooting guard Josh Okogie with the No. 20 overall pick in the 2018 NBA Draft at Barclays Center in Brooklyn, New York Thursday night. During his two years at Georgia Tech, Okogie averaged 16.9 points, 5.8 rebounds, 2.0 assists, 1.5 steals and 0.8 blocks over 33.0 minutes in 61 games, all of which he started for a Yellow Jackets team that advanced to the National Invitational Tournament Championship Game in the 2016-2017 season. As a sophomore in 2017-2018, the 6-foot-4, 207-pound Okogie averaged 18.2 points, 6.3 rebounds, 2.5 assists, 1.8 steals and 1.0 blocks while shooting 41.6 percent from the field, 38.0 percent from three-point range and 82.1 percent at the free-throw line. The Atlanta Hawks selected former University of Maryland shooting guard Kevin Huerter with the No. 19 overall pick in the 2018 NBA Draft at Barclays Center in Brooklyn, New York Thursday night. During his final season with the Terrapins, Huerter averaged 14.8 points, 5.0 rebounds, 3.4 assists, 0.6 steals and 0.7 blocks over 34.4 minutes in 32 games, all of which he started for a Maryland team that went 19-13 in 2017-2018. Over his two years with Maryland, Huerter averaged 12.0 points, 5.0 rebounds and 3.0 assists, while shooting 46.6 percent from the field, including a 57.2 percent mark from inside the three-point arc, 39.4 percent from long distance and 74.8 percent at the free-throw line. The San Antonio Spurs selected former University of Miami (Florida) shooting guard Lonnie Walker IV with the No. 18 overall pick in the 2018 NBA Draft at Barclays Center in Brooklyn, New York Thursday night. In just one year at Miami, Walker IV averaged 11.5 points, 2.6 rebounds, 1.9 assists, 0.9 steals and 0.5 blocks over 27.8 minutes in 32 games, 18 of which he started for a Hurricanes team that made it to the NCAA Tournament in 2018. Walker IV shot 41.5 percent from the field, including a 48.7 percent mark from inside the three-point arc, and 73.8 percent at the free-throw line during the 2017-2018 season. The Milwaukee Bucks got themselves another scorer with the No. 17 overall pick in the 2018 NBA Draft at Barclays Center in Brooklyn, New York Thursday night. The Bucks selected former Villanova Wildcats shooting guard Donte DiVincenzo, the Most Outstanding Player of the 2018 NCAA Tournament, in the first round. During his final season with the Wildcats, DiVincenzo averaged 13.4 points, 4.8 rebounds, 3.5 assists and 1.1 steals over 29.3 minutes in 40 games, only 10 of which he started. DiVincenzo shot 48.1 percent from the field, 40.1 percent from three-point range and 71.0 percent at the free-throw line in 2017-2018. In 85 career games for Villanova, with whom he won two National Championship titles, DiVincenzo averaged 10.2 points, 4.0 rebounds, 2.4 assists and 0.9 steals. The happy homecoming did not last long for former Villanova star Mikal Bridges and his family. Drafted by his hometown team, the very squad his mother works for in the front office, Bridges was dealt to the Phoenix Suns less than one hour later in exchange for small forward Zhaire Smith, whom the Suns selected with the No. 16 overall pick in the 2018 NBA Draft at Barclays Center in Brooklyn, New York Thursday night. In addition to Smith, the Suns sent a 2021 first-round pick from the Miami Heat to the 76ers. The Phoenix Suns selected former Texas Tech small forward Zhaire Smith with the No. 16 overall pick in the 2018 NBA Draft at Barclays Center in Brooklyn, New York Thursday night. During his only year with the Red Raiders, Smith averaged 11.3 points, 5.0 rebounds, 1.8 assists, 1.1 steals and 1.1 blocks over 28.4 minutes in 37 games, including 21 starts, for a team that advanced to the “Elite Eight” of the 2018 NCAA Tournament before bowing out against the eventual National Champion Villanova Wildcats. Smith shot 55.6 percent from the field, 45.0 percent from three-point range and 71.7 percent at the free-throw line during the 2017-2018 season. The Washington Wizards selected former University of Oregon small forward Troy Brown with the No. 15 overall pick in the 2018 NBA Draft at Barclays Center in Brooklyn, New York Thursday night. Brown shot 44.4 percent from the field, 52.4 percent from inside the three-point arc and 74.3 percent at the free-throw line during the 2017-2018 season. The Denver Nuggets took a gamble with the No. 14 overall pick in the 2018 NBA Draft at Barclays Center in Brooklyn, New York Thursday night. Despite his freefall to the bottom of the NBA Draft Lottery, the Nuggets selected former University of Missouri small forward Michael Porter Jr. at No. 14. Porter Jr. dropped to the bottom of the NBA Draft Lottery because of back surgery in early November that has some national NBA reporters claiming that he could be “red-shirted” and forced to sit out for the entire 2018-2019 season in order to get back to full health. The 6-foot-10, 215-pound Porter Jr. averaged 10.0 points, 6.7 rebounds and 1.0 steals over 17.7 minutes in just three games during his career at Missouri. The Los Angeles Clippers selected former Boston College shooting guard Jerome Robinson with the No. 13 overall pick in the 2018 NBA Draft at Barclays Center in Brooklyn, New York Thursday night. In three years with the Eagles, Robinson averaged 17.7 points, 3.8 rebounds, 3.3 assists and 1.3 steals over 34.6 minutes in 90 games, all of which he started, for a Boston College team that won 19 games during his final season. The 6-foot-7, 181-pound Robinson averaged an Atlantic Coast Conference-best 20.7 points and 3.3 assists per game during the 2017-2018 season. Robinson shot 48.5 percent from the field, 53.3 percent from inside the three-point arc and 83.0 percent at the free-throw line during his final season at Boston College. The Charlotte Hornets and Los Angeles Clippers agreed to the second trade in the first round of the 2018 NBA Draft at Barclays Center in Brooklyn, New York Thursday night. After selecting former University of Kentucky point guard Shai Gilgeous-Alexander with the No. 11 overall pick, the Hornets dealt the Wildcats ball-handler to the Clippers in exchange for former Michigan State small forward Miles Bridges. In order to complete the trade, the Clippers sent two future second-round picks to Charlotte. The Los Angeles Clippers selected former Michigan State small forward Miles Bridges with the No. 12 overall pick in the 2018 NBA Draft at Barclays Center in Brooklyn, New York Thursday night. A two-year player for Michigan State, Bridges averaged 17.0 points, 7.6 rebounds, 2.4 assists and 1.1 blocks over 31.6 minutes of play over 62 games, including 60 starts for a Spartans team that advanced to the second round of the NCAA Tournament in each of the last two seasons. The 6-foot-7, 230-pound Bridges shot 47.0 percent from the field, 36.4 percent from three-point range and 77.6 percent at the free-throw line in his two years with the Spartans. The Charlotte Hornets selected former University of Kentucky point guard Shai Gilgeous-Alexander with the No. 11 overall pick in the 2018 NBA Draft at Barclays Center in Brooklyn, New York Thursday night. Gilgeous-Alexander averaged 14.4 points, 4.1 rebounds, 1.6 steals and 0.5 blocks over 33.7 minutes per game for a Kentucky team that won the 2018 Southeastern Conference Tournament and advanced to the “Sweet 16” of the NCAA Tournament this past season. A 6-foot-6, 180-pound native of Hamilton, Ontario, Canada, Gilgeous-Alexander shot 48.5 percent from the field, 40.4 percent from three-point range and 81.7 percent at the free-throw line during the 2017-2018 season. The Philadelphia 76ers did not have to go far to scout the player they wanted with the No. 10 overall pick in the 2018 NBA Draft. The 76ers selected former Villanova small forward Mikal Bridges, who averaged 17.7 points, 5.3 rebounds, 1.9 assists, 1.5 steals and 1.1 blocks over 32.1 minutes over 40 starts for a Wildcats team that won both the 2018 Big East Tournament and NCAA Tournament. Bridges was a part of two National Championship teams during his Villanova career. An All-NCAA Tournament selection this year, Bridges shot 51.4 percent from the field, 43.5 percent from three-point range and 85.1 percent at the free-throw line during the 2017-2018 season. The New York Knicks selected former University of Kentucky small forward Kevin Knox with the No. 9 overall pick in the 2018 NBA Draft at Barclays Center in Brooklyn, New York Thursday night. The 6-foot-9, 215-pound Knox averaged 15.6 points, 5.4 rebounds and 1.4 assists over 32.4 minutes per game for a Kentucky team that won the 2018 Southeastern Conference Tournament and advanced to the “Sweet 16” of the NCAA Tournament this past season. Knox shot 44.5 percent from the field, 34.1 percent from three-point range and 77.4 percent at the free-throw line during the 2017-2018 season. CLEVELAND -- The Cleveland Cavaliers selected former University of Alabama point guard Collin Sexton with the No. 8 overall pick in the 2018 NBA Draft at Barclays Center in Brooklyn, New York Thursday night. Sexton averaged 19.2 points, 3.8 rebounds, 3.6 assists and 0.8 steals over 29.9 minutes per game for an Alabama team that went to the semifinals of the 2018 Southeastern Conference Tournament and went two rounds deep in the NCAA Tournament before bowing out against the eventual National Champion Villanova Wildcats. The 6-foot-3, 190-pound Sexton shot 44.7 percent from the field, 49.5 percent from inside the three-point arc and 77.8 percent at the free-throw line. The Atlanta Hawks and Dallas Mavericks combined on the first trade during the 2018 NBA Draft at Barclays Center in Brooklyn, New York Thursday night. The Hawks selected Euroleague standout Luka Doncic with the No. 3 overall pick, but did so with a deal reportedly in place with the Mavericks, who held the No. 5 selection and later chose former Oklahoma guard Trae Young. In order to complete the trade, the Mavericks sent a future first-round pick to the Hawks. The Chicago Bulls selected former Duke University standout Wendell Carter Jr. with the No. 7 overall pick in the 2018 NBA Draft at Barclays Center in Brooklyn, New York Thursday night. The 6-foot-10, 259-pound Carter Jr. averaged 13.5 points, 9.1 rebounds, 2.0 assists, 2.1 blocks and 0.8 steals over 26.9 minutes per game for a Duke team that advanced to the semifinals of the Atlantic Coast Conference Tournament and the NCAA Tournament’s Midwest Regional Championship game. Carter Jr. shot 56.1 percent from the field, 41.3 percent from three-point range and 73.8 percent at the free-throw line during the 2017-2018 season. The Orlando Magic selected former University of Texas star Mohamed Bamba with the No. 6 overall pick in the 2018 NBA Draft at Barclays Center in Brooklyn, New York Thursday night. A native of Harlem, New York, Bamba averaged 12.9 points, 10.5 rebounds and 3.7 blocks over 30.2 minutes per game during his only season with the Longhorns, who earned an at-large bid to the 2018 NCAA Tournament this past year. The 6-foot-11, 225-pound Bamba has a 7-foot-10 wingspan and used that reach advantage to send away 111 shots, corral 316 rebounds and steal 23 passes during the 2017-2018 season. The Dallas Mavericks selected former University of Oklahoma point guard Trae Young with the No. 5 overall pick in the 2018 NBA Draft at Barclays Center in Brooklyn, New York Thursday night. Young averaged 27.4 points, 8.7 assists, 3.9 rebounds and 1.7 steals over 35.4 minutes of play during his only season at Oklahoma. Young converted 42.2 percent of his field goal attempts (261 of 618), 36.0 percent of his three-point tries (118 of 328) and 86.1 percent of his free throws (236 of 274). The 6-foot-2, 180-pound Young handed out 279 assists against 167 turnovers, stole 54 passes, blocked eight shots and scored 876 points, more than 2.5 times better than Oklahoma’s next leading scorer, Christian James. Young led the nation in both scoring and assists during the 2017-2018 season. The Memphis Grizzlies went with a player with a basketball pedigree at the No. 4 overall pick in the 2018 NBA Draft. The Grizzlies were comfortable with the medical evaluations and selected former Michigan State University forward Jaren Jackson Jr. with at No. 4 overall in the 2018 NBA Draft at Barclays Center in Brooklyn, New York Thursday night. The 6-foot-11, 242-pound Jackson Jr. averaged 10.9 points, 5.8 rebounds, 1.1 assists and 3.0 blocks over 21.8 minutes of play for the Spartans during the 2017-2018 season. Jackson Jr. won the Big Ten Conference Freshman and Defensive Player of the Year this past year. Jackson Jr. shot 51.3 percent from the field, 39.6 percent from three-point range and 79.7 percent at the free-throw line. The Atlanta Hawks added an international flare with the No. 3 overall pick in the 2018 NBA Draft. The Hawks selected Euroleague star guard Luka Doncic with their first-round pick in the 2018 NBA Draft at Barclays Center in Brooklyn, New York Thursday night. The 6-foot-6 Doncic is a native of Slovenia and has been a professional for four seasons despite turning only 19 years old in February. Doncic averaged a career-best 14.5 points, 5.2 rebounds, 4.6 assists and 1.1 steals over 25.0 minutes per game for a Real Madrid team against Liga ACB and Euroleague competition this past season. The Euroleague Final Four Most Valuable Player after leading Real Madrid to a Championship Game win over Fenerbahce Dogus of Istanbul, Doncic shot 45.6 percent from the field, 59.2 percent from two-point range and 80.1 percent at the free-throw line during the 2017-2018 season. 7:44 p.m.-SACRAMENTO KINGS SELECT MARVIN BAGLEY JR. The Sacramento Kings went to “Basketball Royalty” to find their man with the No. 2 overall pick in the 2018 NBA Draft. The Kings selected former Duke University forward Marvin Bagley III with their first-round pick in the 2018 NBA Draft at Barclays Center in Brooklyn, New York Thursday night. In his only season with the Blue Devils, Bagley III averaged 21.0 points, 11.1 rebounds, 1.5 assists, 0.9 blocks and 0.8 steals over 33.9 minutes per game for a Duke team that advanced to the semifinals of the Atlantic Coast Conference Tournament and the NCAA Tournament’s Midwest Regional Championship game. Bagley shot 61.4 percent from the field and 39.7 percent from three-point range during his only collegiate season. The Phoenix Suns did not have to go too far to make the No. 1 overall pick in the 2018 NBA Draft. The Suns selected former University of Arizona center Deandre Ayton with the first pick in the 2018 NBA Draft at Barclays Center in Brooklyn, New York Thursday night. In his only season with the Arizona Wildcats, the 7-foot-1, 250-pound Ayton averaged 20.1 points, 11.6 rebounds, 1.6 assists and 1.9 blocks over 33.5 minutes per game for a team that won the Pacific 12 Conference Tournament Championship before an early exit from the 2018 NCAA Tournament. Ayton shot 61.2 percent from the field and 73.3 percent at the free-throw line during his only collegiate season. 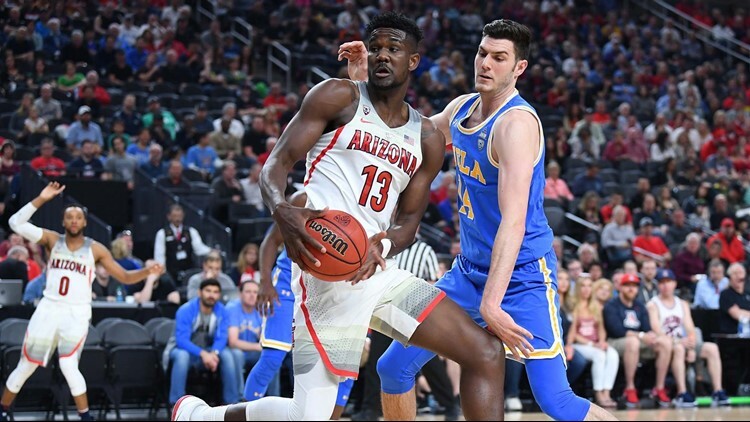 Arizona Wildcats forward Deandre Ayton (13) spins off UCLA Bruins forward Gyorgy Goloman (14) during a semi-final match of the Pac-12 Tournament at T-Mobile Arena in Las Vegas, Nevada. The Cavaliers will make the No. 8 pick in the 2018 NBA Draft. The Cavaliers hold the eighth pick in the 2018 NBA Draft because of an offseason trade with the Boston Celtics. In exchange for multi-time NBA All-Star point guard Kyrie Irving, the Celtics sent forward Jae Crowder, point guard Isaiah Thomas and a pair of draft picks to the Cavaliers. One of those picks was an unprotected selection originally held by the Nets. The 2018 first-round pick was dealt to Boston in a trade for small forward Paul Pierce, center Kevin Garnett and guard Jason Terry, as well as Brooklyn’s first-round picks in 2014 and 2016. Prior to 2018, the Cavaliers have made the No. 8 overall pick in the NBA Draft on four occasions. The Cavaliers chose center DeSagana Diop out of Oak Hill Academy (2001), point guard Andre Miller from Utah (1999), point guard Ron Harper from Miami (Ohio) (1986) and small forward Campy Russell out of Michigan (1974). CLEVELAND -- The fortunes of young men and teams around the NBA could be moments away from changing in a positive direction. The 2018 NBA Draft will get underway at 7 p.m./ET tonight at Barclays Center in Brooklyn, New York, with the Phoenix Suns, Sacramento Kings and Atlanta Hawks holding the first, second and third overall selections.